What Is DA Form 2627-2? DA Form 2627-2, Record of Supplementary Action Under Article 15, UCMJ is a form used to document any supplementary action taken by the appropriate authority to vacate, mitigate, suspend, remit, or set aside a punishment. An exception is any punishment imposed under summarized proceedings. The DA Form 2627 and the DA Form 2627-1 are two forms related to the DA 2627-2. The DA 2627-1 is used to record the summarized proceedings under Article 15 and the DA 2627 is utilized for documenting formal proceedings under the same Article. The latest version of the form - often confused with the DD Form 2627, Request for Government Approval for Aircrew Qualifications and Training - was released by the Department of the Army (DA) in October 2011. A new DA Form 2627-2 fillable version is available for digital filing and download below or can be found through the Army Publishing Directorate website. 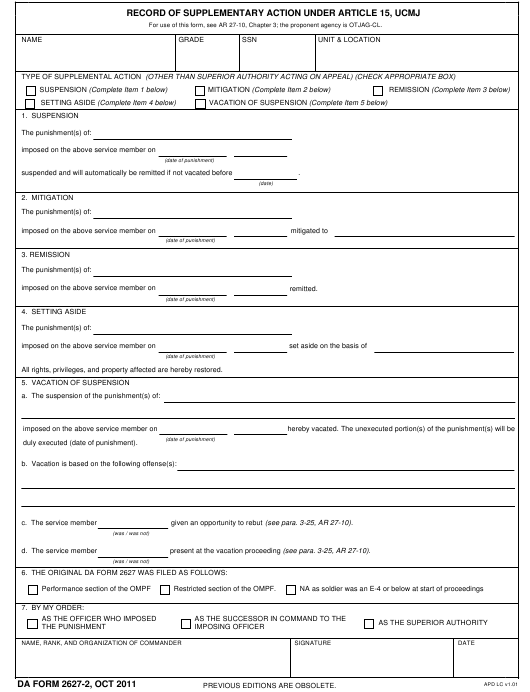 How To Fill Out Da Form 2627-2? For use of this form, see AR 27-10, Chapter 3; the proponent agency is OTJAG-CL. All rights, privileges, and property affected are hereby restored. duly executed (date of punishment). given an opportunity to rebut (see para. 3-25, AR 27-10). present at the vacation proceeding (see para. 3-25, AR 27-10). Restricted section of the OMPF. A Soldier's nonjudicial punishment may be suspended, set aside, mitigated, or remitted. The DA 2627-2 should be filed in either of these cases. The form requires personal identifying information about the alleged offendant, including their name, grade, SSN, unit, and location. After that, the official filing the form must identify the supplemental action and complete the next several corresponding blocks. Block 1 is filled out when the punishment is suspended. It is usually done to grant the Soldier a probation period during which they may demonstrate that they deserve remission. Any suspended punishment may be vacated by the commander if the Soldier has committed misconduct during the suspension period. The punishment may be mitigated if it was disproportionate to the offense or if the officials decide that the Soldier deserves a reduction for good conduct. The action is then recorded in Block 2. If any part of the unexecuted punishment is canceled, the information about it should be provided in Block 3. A postponed punishment (whether executed or unexecuted) has to be described in Block 4. A vacation of the suspended punishment is described in Block 5. Block 6 identifies the purpose of the original DA Form 2627 connected to the case. Block 7 identifies the official giving out the order. The name, rank, organization, and signature of the commander are provided at the bottom of the form.